Step 1: Dig into your current spending. How much are you paying for groceries right now? This isn’t a number you should guess at. Scan through last month’s bank statement and see what you spent on meat, cheese and fresh-packed pickles. Is it way more than you expected? Is it more than you want to pay? This is your starting point. Step 2: Set your new amount. Now that you know how much you’ve been paying Trader Joe, figure out how much you’d rather pay him. For example, if you spent $600 on groceries last month and want to cut back a little, try knocking it down to $500 this month. Keep it realistic. Step 3: Break it down into smaller chunks. Before you start shopping, divide your total budget into a more digestible amount. Take that $500 for the month and divide it into four weeks ($125). Thinking in smaller amounts will keep you from blowing $400 in the first week and eating PB&Js for the next three. Make a meal plan. Plan breakfasts, lunches, dinners and snacks for the next week. Then write out your shopping list based around the meal plan. Stick to the list to avoid impulse purchases. Think generic. If you’re already buying generic sugar and salt, why not go all in? In a recent case study, researchers concluded that Americans could save $44 billion collectively if we bought more store-brand items and less name-brand stuff. Just read the labels first. Buy in bulk. When it comes to non-perishable goods (or that spinach you use in your daily salad), grab the bigger size. You’ll save more per ounce and cut down on wasteful packaging. You might even be able to freeze what you don’t need right away! Swap grocery stores. Just because you know where all your favorite foods are doesn’t mean you’re getting the best deal. Try a new grocery store (or combination of stores) and you could save a bundle. Ask your deal-savvy friends where they shop and go from there. Step 5: Evaluate every month. Once the month ends, look back at what worked and what didn’t. If you met your grocery goal with $50 to spare, that’s excellent! If you ended up going over budget, try simplifying some of your meal plans or bumping up your budget a bit. 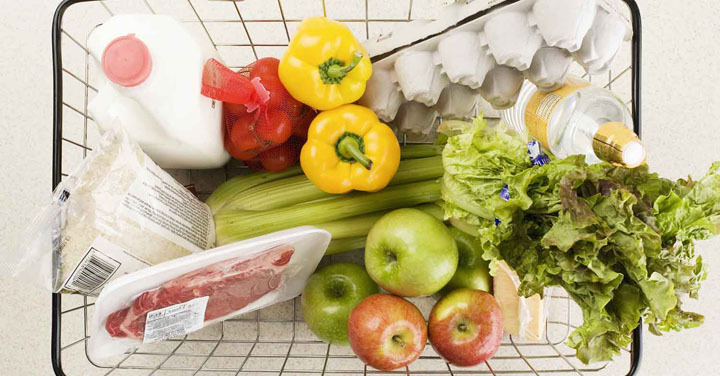 In a month or two, you should find the grocery budget that’s right for you. No more wondering if you’re overspending. No more comparing yourself to your friends and family. You’ll be in control and confident you’re doing it right! Create a grocery budget that works for you with EveryDollar. It’s free and only takes 10 minutes to set up!